UPDATE: Salt Lake Tribune beat writer Brian T. Smith is tweeting a ton of updates on the Sloan situation, including reports that Sloan had “lost” the trust of his team.According to Smith, multiple sources have confirmed that Sloan and star point guard Deron Williams had several “heated confrontations” this season, including one on Wednesday night. Several players had grown frustrated with his system and Williams would not have returned next season unless Sloan left. 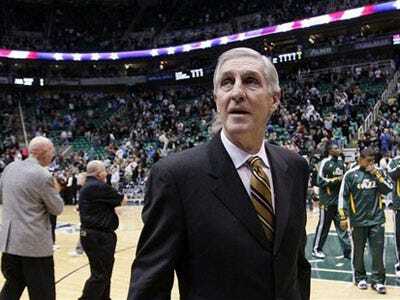 EARLIER: The Deseret News is reporting that Utah Jazz head coach Jerry Sloan will resign later today. Sloan has been coaching the Jazz for 23 years, the longest current tenure of any coach in the four major professional sports. He’s only had one losing season in Utah, winning 60% of the games in his career. HIs team is currently in 2nd place in the Northwest Division (sixth in the Western Conference), but has lost 10 of its last 14 games. Sloan didn’t speak to reporters immediately after last night’s loss to the Bulls, staying in his office for a 30-minute “discussion” with GM Kevin O’Connor. Sloan just signed a one-year contract extension on Monday.